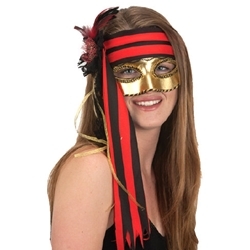 Gold mask with red and black ribbon headband and feather and lace trim. Mask is one size fits all using an elastic sizing strap. This mask can be used on its own to create a quick, easy, and affordable pirate costume or paired up with a female pirate costume for a pirate themed masquerade party. Mix and match this mask with more of our pirate themed costume accessories to create a unique pirate costume.